counterpointElite members got a kick in the face! Best Players of the respective classes of ALL TIME in PvP discussion. when does the leveling event end? Good news! We’ve been working hard here to make sure that our EU players can receive the same benefits for the Twitch Prime Promotion we’ve been running. EU players can now participate in the promotion! So HURRY! En Masse: Action RPG Pack #1 will be over on Monday, April 22! TERA players get the Twitch-exclusive Ultra-Violent Armor, Elite Status, and other boosts! TERA players a matching Ultra-Violent Helmet, more Elite Status and boosts! Not that I want to spend money to have a chance at getting a shiny new phoenix for my priest, but I would like to resurrect myself once an hour via the mount power. Please update the store to match the weekly message! Our delayed shipment of phoenix loot boxes has arrived. We're unpacking them now and they will be available Thursday morning. Sorry for the wait! The somewhat rare inventory issue that resulted in a server crash has been fixed. Flying Mounts will now obey TERA's normal flying regulations and will once again start their descent as soon as the flying gauge has been depleted. +10 or higher Misery, Deathwrack, Behemoth, and Oblit gear will now appropriately display within the Enchant sub-menu. Twistshard Weapon / Armor's enchanting cost has been corrected to the intended values. The TERA Game App will no longer crash when entering the game with certain enchanting effects. Ruinous Manor > 2nd boss's pattern > fixed a display problem in the combat area when baby spider turns to sleep state. 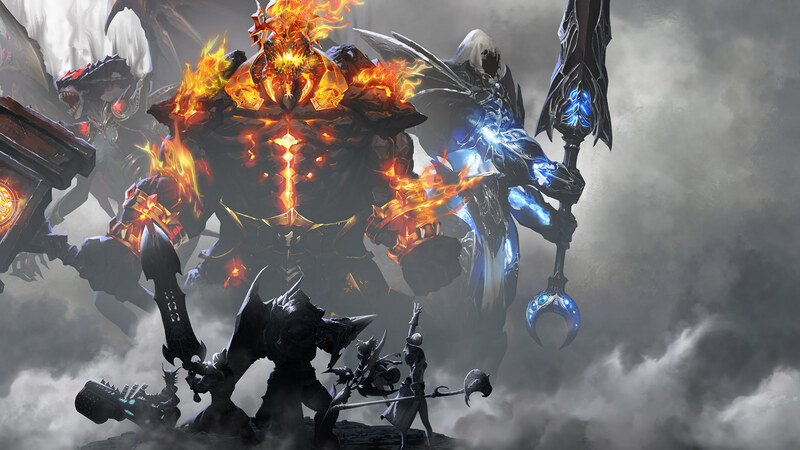 The TERA Game App will no longer crash when gear option UI is opened while in combat. Thaumetal Refinery > 1st boss's pattern no longer causes client crash. Civil Unrest: Velika related NPC's showed up for work a little early. We've sent them home until its time to battle. Gear enchanting / upgrade UI > gear level now appropriately displays in 000 / 000 format. When receiving guild quest reward via parcel, parcel title section is no longer missing. 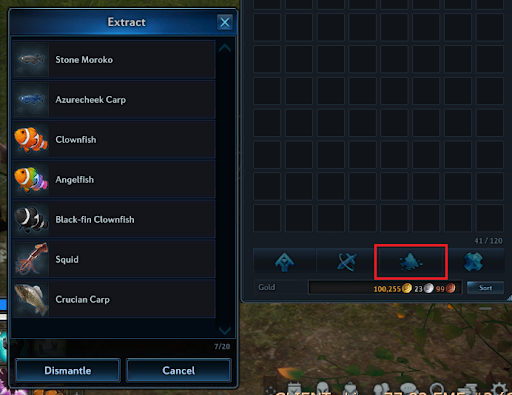 Item option selection UI > selecting an option and moving to a different tab no longer displays the previously selected option. Selecting Upgrade menu while crystals are equipped will display Upgrade UI briefly. * Please note that Xbox had already received these Bug fixes. This issue has been filed as a bug. Thank you for the report! We heard lots of people on the stream earlier today really liked our images from Skywatch: New Heights, so here are some images for you! The PS4 Maintenance had a technical issue that prevented maintenance from taking place last night, but we are pushing for that to take place as soon as possible, and when we've locked in a new time for maintenance, we'll be sure to announce it. The New Heights update kicks off an epic new journey for TERA players! Skywatch is coming to TERA—and it’s bringing a new level-cap increase, along with tougher BAMs, a skill-advancement system, gear fusion, a new system for daily dungeon entries…and an epic new threat to the world that will play out over the next several updates. Because this level cap increase isn’t a simple matter of just changing the maximum level, the new level cap won’t be something that you are likely to hit in a few hours of play. Plan accordingly! Be the first on your server to reach level 70 in your chosen class, and you’ll earn a “server first” achievement. Your best opportunities to acquire significant XP (to maximize your leveling-up) include BAMs, dungeons, fishing, and crafting/gathering. An added questline—"The Nightmare Begins"—will get you started advancing from level 65 to level 70, and help you earn new gear. We’re changing how high-level BAMs spawn, to improve the experience of hunting monsters in the open world. These BAMs have been updated to level 66–70, as part of the plan to help you reach the new level cap. You’ll encounter most of these as part of the new questline—specifically in Essenian Crest, Val Aureum, Ex Prima, Balder’s Refuge, and Celestial Hills. Look for new daily quests similar to Vanguard Requests, but that can only be undertaken in the open world locations mentioned above. As you level up, more of these daily quests will become available to you. These quests will reward you with both leveling XP and skill advancement XP. We’re also introducing more powerful open-world bosses to test your mettle. These bosses are bigger than normal (like the ones you find on the Island of Dawn), and they have special aura effects. These bosses spawn at random times and at random locations (within the 65–70 leveling zones listed above, on Channel 1). Anyone can participate in battling these bosses; you are not restricted by item level), and you can join the fight solo, or with a party. Helping to defeat these bosses rewards you with leveling XP and skill advancement XP (see below). 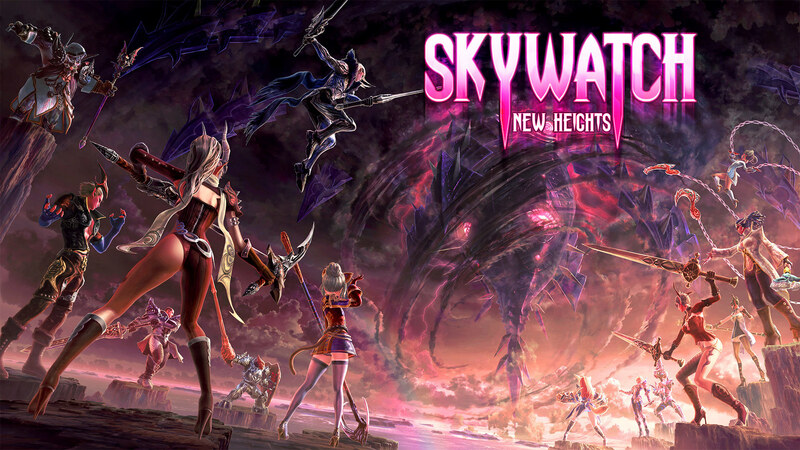 The new level cap means that your skills will also get better—but rather than simply raising your skills one level, Skywatch introduces a new system called “Skill Advancement,” which lets you adjust how and how effectively your skills work. This system lets you gradually improve skill performance and character stats, as well as select between optimizations to specialize your skills. Uses Skill Advancement Points and Skill Advancement Scrolls. Increase the skill’s effectiveness up to 60 times. Optimization at level 67 and 69: three Skill Advancement options become available. Unlocking these costs gold and uses Skill Optimization Scrolls. Once you unlock the options, you can freely switch between them at any time (except during combat). This allows you to select the skill option that best suits your current needs. You get Skill Advancement Points from earning enough Skill Advancement XP. You can earn Skill Advancement XP from defeating level 65 BAMs (and higher), completing Vanguard Requests, and so on. Earn scrolls from daily quests and high-level dungeons. This new system lets you combine two pieces of Frostmetal, Stormcry, or Heroic Oath gear to add additional gear options. You will need the target gear and the “fodder” gear. Combining the two will add some of fodder’s options to the target gear. The fodder gear’s tooltip indicates whether it can be used as a fusion fodder or not. Depending on how many fusion options the target can take, some of the options on this fodder gear will be transferred to the target gear in the fusion process. Which of the fodder’s options are transferred are determined randomly. Fodder gear is available from instances and open world content. Skywatch adds two new gear slots: Halidoms and Relics. These slots unlock when your character reaches level 66, when you complete the new questline. You can acquire halidoms and relics (ranging from uncommon to legendary) from dungeon bosses, and the new open-world BAMs and bosses. You can upgrade both of these new gear items, up to Tier V (currently). Upgrading boosts their stats. Skywatch revises the dungeon entry limit system by replacing daily entry count with a weekly entry count and replacing reset scrolls with Adventure Coins. In short, each time you enter a dungeon, it will consume some of your Adventure Coins. The idea behind this system is to reduce the burden of daily dungeon entries that players encountered with the daily entry limit, and to allow you to play more of the dungeons you enjoy. You can enter each dungeon up to 40 times (not including solo/leveling zone dungeons). Your total Adventure Coins display right above your MP bar. 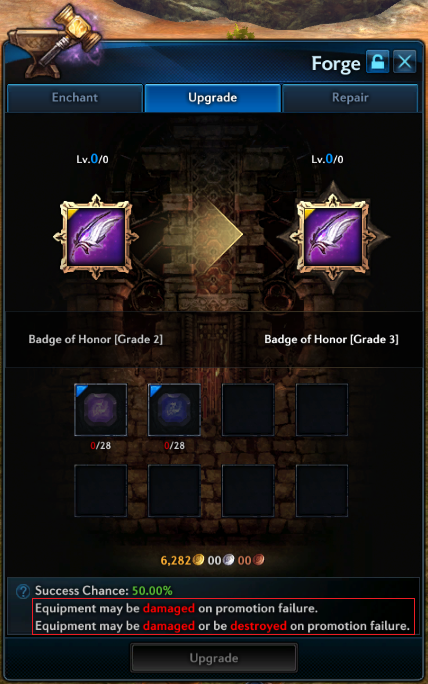 The number of Adventure Coins required to enter is different for each dungeon: Higher-tier dungeons (with greater rewards) require more coins to enter. This also means that lower-tier dungeons require fewer coins to allow players with low item levels to work on getting better gear. Coin requirements are shown in Vanguard Request or dungeon matching UI. Elite status increases your maximum coin limit, replenishment speed, and weekly entry limits. Your coins replenish at a rate of 3 coins every three minutes, or 4 every three minutes for elite players. This occurs whether you are online or not. If you still have dungeon reset scrolls in your inventory, you can sell them to merchants for gold. 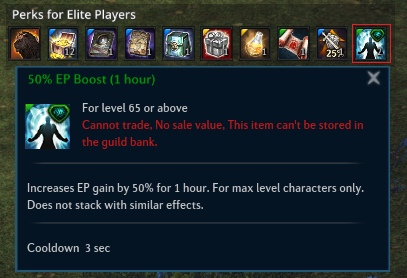 Changed 25% Item XP Boost to 100% XP Boost, with a 20-hour cooldown. Changed 50% EP Boost to 2× 100% EP Boost, with a 24-hour (daily) cooldown. Lilith's Trial is a solo version of Lilith’s Keep, where you race the clock to fight your way through Lilith’s forces, and confront the vampiric noblewoman in her lair. Bastion of Lok, Sinestral Manor, and Cultists' Refuge all now have a solo version, allowing players to experience the dungeon content without having to go through the process of instance matching. Antaroth's Abyss, Grotto of Lost Souls, and Dark Reach Citadel now have 7-player versions. Progression dungeons are now set to 3-person complexity, with no role restrictions. Skywatch also marks the start of Achievement Season 10. The prices of the enchantments for gear are much higher compared to those of the pc version. I had like 10 blue screens when i switch between characters. From what I have seen, it looks like the values followed other TERA PC regions like KR and EU, rather than TERA PC NA's costs. This was actually asked in the EME Discord earlier this morning. I known it was on the to-do list. Perhaps either Rox or Singlebear might know more. In an effort to identify new issues that have have been included in with the TERA: Reloaded update as soon as possible, please use this Thread to discuss them, as well as any large changes that were not communicated within the Patch Notes. There is an issue that has caused Thaumetal Refinery and Thaumetal Refinery (Hard) to delayed until a Hotfix can be delivered. Level 60 Scroll can be applied. Deprecated Materials will indicate in their tooltip if they can no longer be used. UI changes to the enchantment system. Previous level 65 gear can now be upgraded to new gear. Oblit, Deathwrack, Behemoth, Ambush, and Misery equipment can be used to upgrade to new sets. Class balance changes for all classes. Raid, Field boss rewards, Battleground, and Level 65 dungeon rewards have been updated. Max Guild level increased to 309. The total number of Character Slots increases from 17 to 18. Nouvelle option de personnage ! L'Artilleuse Élin est désormais disponible ! Le niveau 60 peut être appliqué. Des matériaux ont été ajoutés au nouveau système d'enchantement. Les anciens matériaux ne peuvent plus être utilisés. Ils peuvent être démantelés pour créer des emblèmes entropiques ou de métamorphose. Pour ce faire, accédez au menu et choisissez "Démanteler". Les infobulles des matériaux obsolètes indiqueront que vous ne pouvez plus les utiliser. Des changements ont été apportés à l'interface du système d'enchantement. Les anciens équipements de niveau 65 peuvent désormais être améliorés afin d'obtenir un équipement flambant neuf. Équipements de pierre magique de sang, de saturne et de fureur criarde. Les équipements du dragon ténébreux, impitoyable du forgeron, du dragon vénérable Vergos, attrayante du forgeron et de Veldeg peuvent être utilisés pour passer aux nouveaux ensembles. Accès via Personnage > Journal de quêtes > Légion des gardiens depuis le menu. Flotte en Morceaux – Niveau d'équipement 364. Croiseur céleste l'Opiniâtre – Niveau d'équipement 439. Forteresse de Lilitas (difficile) – Niveau d'équipement 439. Entrée de la Fournaise d'Archeron. L'équilibre des classes change pour toutes les classes. Les champs de bataille, les récompenses de boss, les raids et les récompenses des donjons de niveau 65 ont été mis à jour. Le niveau maximum des guildes a été porté à 309. Le nombre total de slots de personnage passe de 17 à 18. Race Change Voucher kann auf bereits bestehende Gunners angewendet werden. Level 60 Scroll kann angewendet werden. Altes Material kann nicht mehr verwendet werden. Es kann in Zeichen und Beweise des Wandels zerlegt werden, wählt dazu im Menü „Zerlegen“ aus. Veraltete Materialien weisen in der Beschreibung darauf hin, dass sie nicht mehr verwendet werden können. Ausrüstung der Stufe 65 kann jetzt zu neuer Ausrüstung aufgewertet werden. Ausrüstung des Finsterdrachens, des kaltblütigen Schmieds, des Erzdrachen Vergos, des verlockenden Schmieds und Veldegs kann zu neuen Sets aufgewertet werden. Änderungen des Klassensaldos für alle Klassen. Die Gesamtzahl der Character Slots steigt von 17 auf 18. The steps to continue on any Open / Unresolved Tickets from the Older System are located HERE. "If you've created any tickets using our old system you'll need to create a new support request, please include the incident number found in the subject line of your e-mail"
News for the next update is planned to go out next week, it'll call out the update and events surrounding it, plus a teaser of anniversary. As @counterpoint mentioned, It's been a crazy time here at En Masse, there's a lot going on behind the scenes, and teams are shifting around. I appreciate those that have been really patient and understanding! @CobaltDragon do you know when the conversion rates, and thus the answer to my question, might be released, in respect to the revamp? I don't know when that information will be made public. Will the special alkahest (personal, extensive, premium) be usable to enchant the older gears, like ambush and deathwrack, after the revamp? in fact, will all alkahest still work? I read from old forums that the special ones stop working. In order to better prepare and get a head start post-revamp, I really need to know the answer to this so that I won't be wasting gold on things that become useless. I want to provide you with an accurate answer, but until all of the conversions rates are released publicly, I cannot answer this question. They said they had some news coming out this week. Perhaps that will provide you the information you're looking for. Hopefully it gets announced similar to the way Deathwrack patch was announced. If you check the date of the News Post, we didn't actually update it from last week's. "Hi everyone! There's no This Week In TERA coming this week - HOWEVER!" "We have huge news coming this week, so keep an eye out for our socials/newsposts this week!" I believe a fix will be coming in an up-coming Maintenance, that will deliver the Bay Gelding Mount to all players who skipped the Tutorial after that feature was introduced, and also add a quest that delivers the Mount, for those who skip the Tutorial going forward. Hey, @CobaltDragon I hate bringing issues like this to you, but I don’t know who else to contact. I finally received my items from my dead server this morning. I did not receive my dyads which were in the gear I had transferred. And my gear was no longer %3 Masterworked(which I guess I can spend more gold on) but still. I have talked to multiple friends as of recent. They got dyads and their gold also did not count as an item. This is making my transfer very difficult as I have worked very hard to perfect my gear. The inconsistency in this process is unfair, simply based on which GM we receive and how they handle my our issue. Is there anything you can do about my dyads? There is know way I could farm them up on the new server in time for my HH runs. For any issues that occur within a Support Ticket, it's best to simply update the Ticket / Support Agent, and politely mention a few things that you expected, that had not been completed. That Agent should be able to read what you wrote, and proceed to fix the remaining issues as soon as possible. This may have also occurred, if you had multiple characters on different Servers before the Console Server Merges took place. If you did not apply an Additional Character Slot Voucher on either Server, your initial character limitation would still be two characters per Server, and the Server Merge had placed all of your characters onto the same Server. We'll check to see if Manglemire should be added to the Scroll, or if it's considered an "Event" Dungeon with the intention of not allowing resets. On the main TERA website, if you scroll down to the image of Discord and hover over it, it shows that clicking it will invite you to our Discord. Players can now participate in weekly raids with Harrowhold, for 20 players. The Raid Leader's status determines the raid's progression. Only the best raids will complete all four phases in the week. Requires item level 423 for match making. Boss drops Oblit Essences, used to upgrade Deathwrack weapons to Oblit weapons. Complete the story quest Requiem for a Dragon to acquire the Marrow Brooch. Marrow Brooch gives a 20 second buff to Power, Crit Factor, and Attack Speed. Manglemire, a max-level 5-player dungeon, contains more tricky mechanics than any other dungeon. Players now have the option to skip the tutorial of Stepstone Isle. Players who opt to skip the tutorial jump to Oblivion Woods as a fully-equipped level 13. Some guide windows will still appear. Les joueurs peuvent désormais participer à des raids hebdomadaires à 20 personnes au Passage détruit du royaume des dieux. Le statut du Chef de raid détermine la progression du raid. Seuls les meilleurs groupes termineront toutes les étapes dans la semaine. Le système de matchmaking impose un niveau d'objet de 423. Le boss lâche des Essences sanguines du dragon ténébreux qui servent à améliorer les Armes impitoyables du forgeron pour en faire des Armes du dragon ténébreux. Terminez la quête narrative Le regard vengeur du dragon permet d'obtenir la Broche de l'ancien dragon. La Broche de l'ancien dragon donne un buff de 20 secondes à la Puissance, au Facteur de coups critiques et à la Vitesse d'attaque. Le Plateau trompeur, un donjon pour 5 joueurs de niveau maximum, contient des mécanismes plus subtils que tout autre donjon. Les joueurs ont maintenant la possibilité d'ignorer le tutoriel des Pierres de gué. Les joueurs qui décident d'ignorer le tutoriel commencent au Bois de l'oubli, et démarrent au niveau 13, entièrement équipés. Quelques fenêtres de conseils apparaîtront toujours. Ajout de quelques options qui permettent d'ajuster la taille de l'interface de chat. Alle Spieler können jetzt an wöchentlichen Schlachtzügen mit jeweils 20 Spielern im Himmelreich der Götter teilnehmen. Der Fortschritt im Schlachtzug hängt vom Status des Schlachtzuganführers ab. Nur die besten Schlachtzuggruppen werden alle vier Abschnitte innerhalb einer Woche abschließen können. Zur Gruppensuche wird Ausrüstungsstufe 423 vorausgesetzt. Vom Boss des Schlachtzugs könnt ihr Blutrote Essenz des Finsterdrachen erbeuten, mit der ihr Kaltblütiger-Schmied-Ausrüstung zu Finsterdrachen-Ausrüstung verbessern könnt. Schließt die Handlungsquest „Der rachsüchtige Blick des Drachen“ ab, um die Brosche des alten Drachen zu erhalten. Die Brosche des alten Drachen verstärkt 20 Sekunden lang eure Werte für Kraft, Kritischen Trefferwert und Angriffsgeschwindigkeit. Mogelplateau, ein Dungeon für bis zu 5 Spieler, trumpft mit noch mehr trickreichen Mechaniken auf als alle bisherigen Dungeons. Spieler können ab sofort die Einführungssequenz auf der Traumbauminsel überspringen. Spieler, die diese Sequenz überspringen, werden direkt mit voller Ausrüstung auf Stufe 13 in die Wälder der Vergessenheit transportiert. Einige Infofenster werden trotzdem eingeblendet werden. We're working with Bluehole to fix the item issue. The boxes have been pulled from the store, and will remain so until we fix this issue. In the meantime, players that received the incorrect non-dyeable item from the loot box can contact support and we will swap them out for you! That seems like a very sound theory for them to test. I know they are working on the issue, so they "may have" figured out the root cause by now, or they may not. I am tagging @CobaltDragon and @Sarumonin in this thread for you. Either CobaltDragon may see it, or Sarumonin may pass your theory on to him for testing, if they haven't already confirmed or ruled out the possibility that part of the programming is allowing the additional entry, but then another part of the programming is booting them back out for too many entries. I had to scrap the extra Dungeon Entry Event, it will now be a Triple Vanguard ( items, gold, and Rep credit) Event for the same duration. PS4 EU's Dungeon Highlight experienced an issue. An attempt was made to modify the configurations and get it to kick-start the Event, but that wasn't successful, so ultimately the entire Event has to be erased and remade from scratch, so an extension of a few hours will be added on to the End Time for PS4 EU. The Noble Specter Mount is intended to be Ultra Rare. Although you have pointed out that it cannot be traded to other players after you have received through the Strongbox Jackpot, I'll go ahead and mention that the Mount can be placed into your Bank, which means if you decide you want the Mount on an Alt Character, or perhaps on a future character you haven't created yet, you'll at least have the option to save it until you've decided what you'll ultimately want to do with it. Can you provide more context ? Are you referring to the Mystic's Summon "Thrall of Life" , or some other type of Class Skill ? Also, when reporting something like this, it's always helpful to add a short video clip showcasing the issue, as that certainly accelerates the rate in which this issue is fully identified, thoroughly reported, and a fix can get implemented. @PYGN3PMNTE - If you're able to provide short video clips of each individual issue, I'll be happy to add those to the existing bug report, which could increase the rate of both issue being addressed. We wanted to give you a quick update on this issue, regarding the Cutting Edge Valkyrie title. As you know, we removed, then disabled, this feat from the game shortly after the class went live. To keep with our policy of transparency, I’d like to break down what happened, and why. Due to an unfortunate miscommunication, we were not aware that the Cutting Edge Valkyrie feat and title was active in the build before launch, and thus did not include it in our Valkyrie launch events. To further complicate matters, a change we’d made to temporarily disable level 60 scrolls for Valkyries did not go into effect during maintenance. These two issues combined to create an exploit which several players took advantage of in the first hour of play. To prevent further problems, we disabled the feat as soon as we were aware of the exploit, and removed the title from all characters in all regions. While this decision is final, we are working to identify the first few players that would have legitimately leveled their Valkyries to level 65 within the first day of play. Once we have that data, we may arrange for an apology gift of some kind (honoring the dedication shown by these players), to be delivered during a future maintenance. It's releasing later in Europe. Sony EU and Sony NA are separate companies with separate release schedules, which we unfortunately do not control. When it's available, we will certainly let you know. What exactly are you looking for in codes? How do you want to interact with EME so that you feel like there's a relationship here? Gifts are great, but I'd like a little more meaning other than screaming "FREE STUFF" and throwing it in the air without a care. I'd prefer to have meaning and reason for doing those types of things. Is that unrealistic? I still have my tree up...don't judge me! We took the happy holidays loading screen down, which ones are you not happy with anymore? How's taking those down on Feb 1st? I feel like that's pretty okay? 1. Fixed Elin race character where the newly added PvP gear did not appear correctly. 2. Disabled Kuma 65 Battleground. Please note: Kuma 20~65 remains open. Changed claim-time on drops from 2 minutes to 45 seconds. Slightly increased spawn rate of field monsters. Removed Strong Bravery potions from the Dragon Scale shop. Replaced Strong Bravery and Strong Canephora potions with Bravery potions at a lower chance. Added Zeta Instance Reset Scroll and Eta Instance Reset Scroll. Replaced Strong Bravery Potion with Elite Bravery Potion. Replaced Strong Canephora Potion with Elite Canephora Potion. Increased Thrall enemy detection speed. Decreased PvP damage of Thrall of Vengeance and Thrall Lord. PvP Gear is not displayed properly on Elin characters. This issue will be resolved in an upcoming hotfix. Are you by-chance referring to the "Deathmatch" system that is on the PC version? "Deathmatches are team battles that can be held anywhere. They do not have the area or zone restrictions that PKs have. Select Deathmatch from the Social menu and organize a custom Team vs Team battle, inviting your friends and/or your enemies. You can even put your money where your mouth is and bet gold and items while battling 10 versus 10"
If you are, I don't believe the Deathmatch system has been added for Console. I remember asking about it pretty early on, but never received confirmation that the system was going to be added. Available from the Bellicarium shop. Damaged gear can be equipped, but no can longer be enchanted or upgraded. A brooch’s grade does not decrease on an upgrade failure, but it may become damaged. Upgrading PvP innerwear uses a different process. Combine Cloth with a Fusion Cube of the same name to create upgraded innerwear. Fusion Cubes can be purchased with Veteran’s Cube Tokens, obtained from Battleground Vanguard Requests. Adjusted rarity of enchanting and upgrading materials. Completable once per day, per character. Re-enabled Shadow Sanguinary and Velik’s Sanctuary. These will be hosting the event “Hammers n’ Hearts” to kick off the build! Added amplifiers with specific Bahaar’s Sanctum boosts. 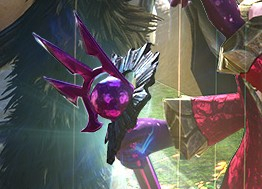 Upper tier accessory with one static buff and three random effects. Replaces your current gear set with Chroas gear, which has increased stats for PvP. Stats for Chroas gear and accessories are approximately equal to those of the new PvP gear + Transcendent jewelry. Chroas gear has no crystal slots. 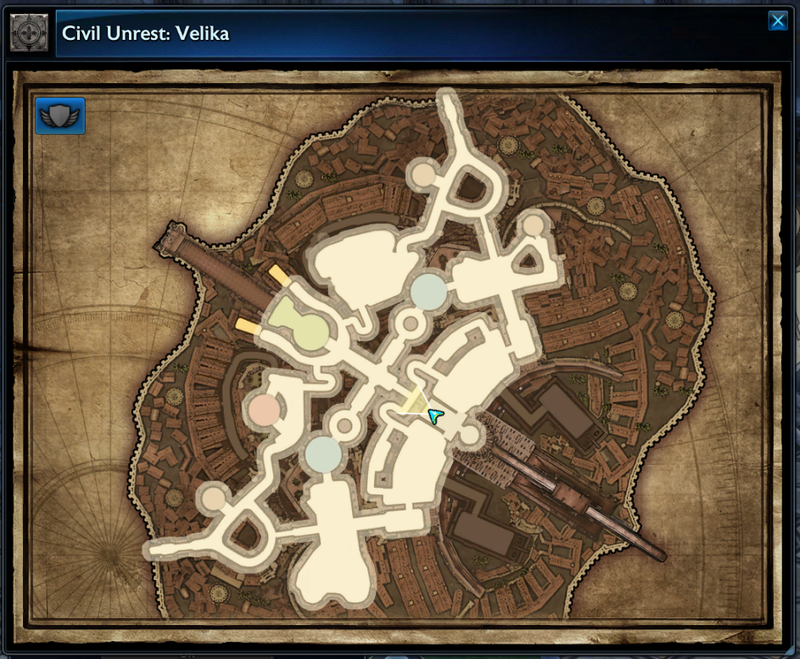 Combat area is not entirely inside the city of Velika. Significantly decreased restricted distance between towers. Significantly decreased tower install radius. 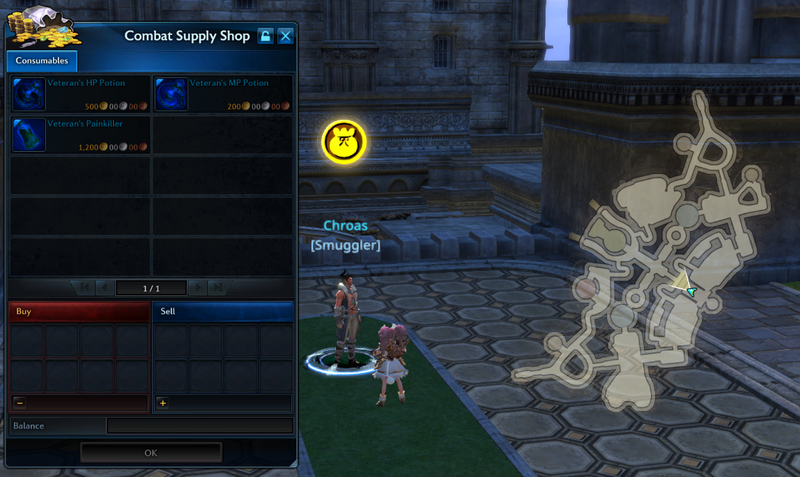 Added Battleground and Civil Unrest exclusive potions, available from Chroas the Smuggler. Added an enrage timer to the boss gauge. From January 15 to January 29 earn time-limited Upgrade items from completing Shadow Sanguinary and Velik’s Sanctuary , and their associated Vanguard Requests. Vanguard rewards give Champion’s Mark Tokens. These tokens can be exchanged for Master Blacksmith’s Hammer, Popo Bait, and other useful items. Imperator has a chance of dropping Dakuryon’s Hammer. Nightmare Imperator has a chance of dropping up to two Dakuryon’s Hammer! Vanguard rewards give Heroic Mark tokens. These tokens can be exchanged for Purified Lakan’s Heart, Popori Bait, and other useful items. Lakan has a chance of dropping Lakan’s Heart. Nightmare Lakan has a chance of dropping up to two Lakan’s Heart! Upgrade items and Tokens will be removed from inventory at 10AM Pacific on February 5. Please note: these Patch Notes are "preliminary", which means we will try to add a second set of changes by January 15th that includes more information. From what we know, this event was not intended to work within dungeons. However, I can confirm that it will work for Dreadspire! It will be addressed during the next following Maintenance (the one after the Valkyrie Class is released). Thanks to everyone that participated in this event! Everyone should have received their Cold Duck footsteps - if you didn't please make sure to check your inbox, I've inquired to folks that either have missing info or maybe changed character names. If you're missing your footsteps, make sure to ask your friend that made the post, as that's my point of contact. Added crystals as drops in some dungeons. Rebalanced bosses for ilevel 423 dungeons. Increased the tab name text size. Adjusted the colors of fonts in the Achievements UI to be more readable. Darkened the background of deactivated Achievement rewards. Added new server connect messaging. Various usability improvements made to the skill combo chain interface. Improved performance in major cities. Fixed an issue where character names didn’t immediately display when entering a city. Reduced the draw-distance and number of characters appearing in Timeless Woods and Frost Reach. Valkyries cannot chain skills off of Shining Crescent or Retaliate. Leaping Slash can only be chained off of Glaive Strike and Ground Bash. Valkyrie chained-skill prompts will not always appear. This will be addressed in a later update. Valkyrie Costumes and Weapon Skins will be introduced into the Fashion Coupon Store at some point prior to January 9th. Cristaux ajoutés comme butin dans certains donjons. Boss rééquilibrés dans les donjons de niveau 423. Augmentation de la taille du texte du nom de l'onglet. Assombrissement des couleurs de la police dans l'interface Épreuves afin qu'elle soit plus lisible. Assombrissement du fond d'écran pour les récompenses d'épreuves désactivées. Nouveau message de connexion au serveur ajouté. Réorganisation des menus de la Boutique TERA. Amélioration de l'interface des attaques combinées pour en simplifier l'utilisation. Amélioration de la performance dans les villes principales. Correction d'un problème qui faisait que les noms des personnages ne s'affichaient pas immédiatement en entrant dans une ville. Réduction de la distance d'affichage et du nombre de personnages apparaissant dans les Bois intemporels et dans la Plaine gelée. Les valkyries ne peuvent pas enchaîner de compétences après Écho de nouvelle lune ou Réaction. Frappe éthérée ne peut être enchaînée qu'après Piqué lunaire ou Poussée terrestre. Les informations des compétences enchaînées des valkyries n'apparaissent pas toujours. Ces problèmes seront corrigés dans une prochaine mise à jour. Les costumes de Valkyrie et les peaux d'armes seront introduits dans le magasin de coupons de mode à un moment donné avant le 9 janvier. Walküren können bei Novaluna-Sonus und Vergeltung keine Fertigkeiten verketten. Ätherhieb kann nur von Lunaraptus und Terramstoß verkettet werden. Meldungen bei Walküren-Kettenfertigkeiten werden nicht immer angezeigt. Diese Probleme werden bei einem zukünftigen Update behoben. You might want to consider adding the EMP to your own Console Account ( if your friend made their character on the same PS4 Server as you ) , and then use the EMP to buy a few things your friend might like, and then send all of those gifts through Parcel Mail along with a Birthday Message. Hi everyone! Thanks for asking about this, we're working on getting these distributed - we had over 500 individuals participate in the event, so we're working on getting those out there! Thanks again so much for participating, and thanks for being so patient! I've asked our QA team to look at this. Could you give more information about this issue please? @6G93R74ET3 The race change voucher is getting updated during our next maintenance (Thursday Jan. 3rd) but you should be able to do that as Brawler now. Thanks for the feedback on the mount! I know that and that's why I'm asking what the final reward will be. Unfortunately, it was too late for us to use the original final reward, due to a technical issue that arose, so the final reward ended up being a Talisman of Lakan, and the Weapon Etching will be offered through a different Event. 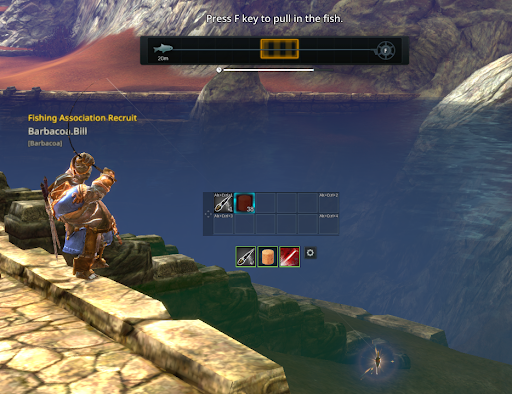 Have you been enjoying fishing in TERA? Take this oppor-tuna-ty to share a fin-tastic tail of your fishy journeys! Give us a good story, and you'll be rewarded Cold Duck footsteps! Be krill-ative as you can! Starting today and ending January 4th at midnight. @iCandyKillz Could you give some more detail as to which party/group gathering you're talking about? You're talking about players in the same party can gather together and everyone gets the same item? Would love some more context, thanks! The good news is that the server maintenance page is correctly showing that the PC servers are under maintenance. The bad news is that we are still verifying the game servers so maintenance has been extended. I talked to a web developer about the server status page this morning and we found the issue (format of status messages changed). We are working on a fix. @DorothyI What I mean by one character, if you submit multiple photos, that particular character will only be rewarded footsteps once. e.g. Taco.King submits 3 photos with different friends, Taco.King only gets 1 set of footsteps. I hope that helps! I also do want to encourage more photos, but if you have other characters, then use them too! Give them love too! Trying to see if there's a solution for this one! @Christin Our Partners each have different schedules, but as Melodys said, that's the Twitch Team, so if you follow those streamers, you can see when they're streaming TERA! I've updated the post to hopefully answer all of your questions! Sealed materials are placed into a chest. @Maleficent94 Could you give more context as to what the brawler rush glitch is please? And have you and @D9MPY4GAFR submitted tickets? I'd like to hear more about this, thanks! @Dokibun If you want to know all of the fun stuff coming up, check out this forum post! It'll get updated weekly, so you'll be able to know what's going on! On Tuesday, December 11, we'll be taking the TERA servers for Xbox One and PlayStation®4 in Europe down 02:00 UTC for scheduled maintenance. We expect the downtime to be two hours. This is a hardware maintenance only. There are no software changes to note. Buffed Crafting Speed from 50% to 99%. Note: This will not disable crafting’s minimum time to complete per item (approximately 3 seconds). Added 2 50% EP Experience (1-hour) boosts to Elite Benefits bar. Learn how to fish by speaking with the popori Waining, in Highwatch, which will kick off the Fishing Association questline. Begin by casting your fishing rod at predetermined spots. Bait is required, and can be purchased and/or crafted. Activate Bait from your inventory and/or skillbar. Fishing consumes one unit each time you get a bite. 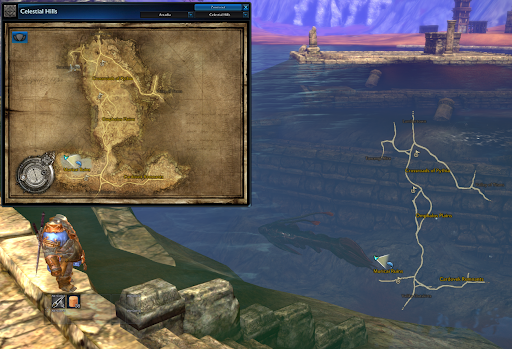 Fishing spots can be found on the World Map. Production Points are not consumed by fishing. Fishing can be done manually or automatically. Manual: Displays a mini-game when you get a bite. Press the interact key [Default: F] to reel in your catch! Automatic: You reel in fish automatically upon getting a bit, until all your bait is gone or your inventory is full. There is one basic (Old), and three advanced (Xermetal, Ash Sapling, and Fairywing) fishing rods. You can purchase the Advanced rods from Angler Token Vendors. A plethora of different types of fish are waiting to be caught! Fish are graded, from grade 0 up to grade 10. Beyond grade 10 you may even find a BAF (Big-[filtered] Fish), but be warned these are only for the most skilled of anglers! Note: BAFs can only be caught via manual fishing. You can deliver fish to an NPC located in cities and fishing spots. The demand list changes every day at 6 a.m. Pacific. You can only deliver fish a limited amount of times per day, and this limit resets at 6 a.m. Pacific. 15 Production Points (PP) restore every 5 minutes while online, and 15 PP restore every 20 minutes while offline. Changed to consume PP upon completion of gathering. Gathering speed increases relative to gathering skill level. Sickle, Pick, and Extractor. All of these can be crafted in the Smelting section. Changed existing gathering skill buff necklaces to decrease gathering time. Materials are now consumed upon when you finish crafting. Existing additives can no longer be used in crafting. Dismantle any old additives into Additive Powder, which can be exchanged for Reagents or sold to vendors. 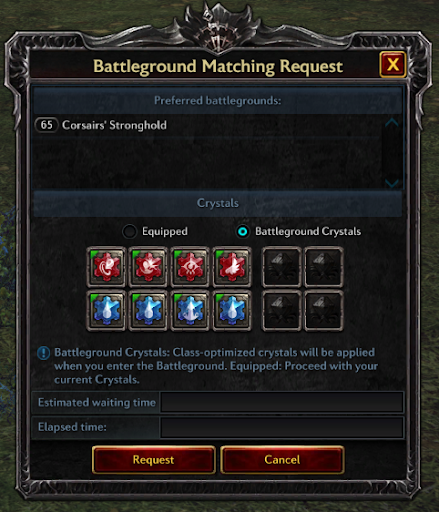 Added an option within Battleground matching UI allowing you to wear your currently equipped crystals, or accept the class-optimized crystals provided. Increased Travel Journal saved spots from 5 to 10 slots. Overhauled Entropic Token Shop contents. 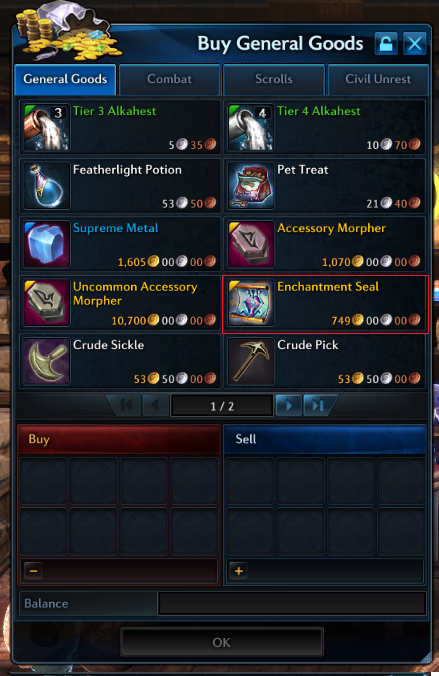 Overhauled Metamorphic Token Shop contents. Adjusted Civil Unrest’s safety zone for spawnable tower locations. Dismantle now has its own menu, allowing multiple items to be dismantled at once. Material Sealing, which will allow some non-bankable materials to be boxed up and banked, is currently disabled. @Christin Hi there! We have updated steam so that the xigncode folders no longer show up. If you had folders pop up before that, no worries, it still would not have triggered it, as when it patches to our most recent version, it wouldn't start xigncode up. Feel free to delete the folders that have xigncode on them! Fixed an issue where using Wintera scarves caused a client crash. I think there may still be some confusion on your part... I explained above, that this is a Developer (Bluehole) implemented design. EME is the Publisher of TERA, and we don't have direct control of how something is designed, though we can push forward suggestions for future updates. do not you think it's a good idea or can nobody play because of you? It's not something that I personally would have direct control over, it is more a design introduced by Bluehole, to avoid matches that could end up being extremely one sided due to how many of one type of Class being grouped together. As long as there is enough players ( Queued Solo for Gridiron ) to fill all of the roles ( Tanks, Healers, DPS ), it should allow the queued players to form a Gridiron raid and teleport all of the players into the match. Is your group queued into Gridiron together or Solo ? Since RMHM is gone, is there a way to get it right now? or is there a hint to be implemented in the future?. The Ambush Belt can now be earned / purchased through the Bellicarium Shop. Is it in reference to the Healer leveling event? -	Fonctionnement du filtre du Chat ajusté en fonction de correspondances partielles et exactes. I'll think this was an oversight, that the rewards from November had been scheduled to go through Monday Dec 3rd , instead of ending on Saturday Dec 1st and kicking off the newer T12 Jackpot Rewards. I apologize for unintentionally misleading players, and hope you can forgive me. Here is the full list of items received as you level up on a Priest / Mystic. Any guesses what this is about? This was something Suggested pretty early on, so we have put in the request for a "Glyph Pre-sets" system, that allows you to have more than one Glyph setup that can be toggled through. At least one of your dreams will come true. I linked my account, but didn't get the mount still. Where do I find it? If done correctly, the Terminus Mount should have been delivered to your Item Claim, and can then be claimed by a single character of your choosing. I am going to tag @CobaltDragon in this, because it might be a better chance he may see your post and pop in with an official answer. According to the main announcement page "... when you hit certain level breakpoints with lancer and brawler characters, you’ll receive special leveling rewards..." I can't find anything that specifies whether it is only for new characters, or if the event includes existing characters. Because of that, I would "guess" that probably any Lancer or Brawler who is not yet level 64 can get the rewards, new or old. If you have an existing Brawler or Lancer, then I just recommend you try to go up a few levels and just see if you get some rewards in your Parcel Post, for that new level. There are rewards every 4 to 7 levels (depending on which level you are), so it shouldn't take very long just to hit one level with rewards, to see if you get them. If you get rewards, then I STRONGLY RECOMMEND going on and getting the other rewards. This event is great, and the free rewards are amazing. I actually created a Lancer and a Brawler on my main gamertag, and got them both to level 65. I had so much fun, I actually created a Lancer and Brawler on my alt gamertag and got both of them to level 64. I will go back get those two up to 65 later, but 64 gave me all of the rewards from the event, so I took a break for now. If you want to just try your existing character, then check this list for all of the rewards, at which levels. https://forums.enmasse.com/tera/discussion/29664/tank-leveling-event-for-lancers-and-brawlers Just look at the next level up from your character's current level, and shoot for that level. When you hit that level, you will get rewards in your Parcel Post, if the event applies to existing characters. You can only do it for ONE Brawler and ONE Lancer per server, so be sure you don't plan on creating that same type of character for the event, if you start leveling up an existing character for the event. Whether you want to try leveling a current character (to see if it works), or if you want to create a new character, be sure to do it soon. The event ends on Friday (23 November). Sounds like you might have needed to download the Deathwrack update in order to access it. As far as I know, no current items available for purchase in the TERA Store will result in needing to do a separate download, as long as your TERA Game App is up-to-date. No, there was not a Maintenance planned for today. There was a unexpected Server crash on Meldita & Akasha today, and some reports of character disconnection on Lakan. when does the consel get the brawler class for elin ? Most like it will be a ways off, since that is a Race/Gender that was just added for Brawlers on TERA PC. 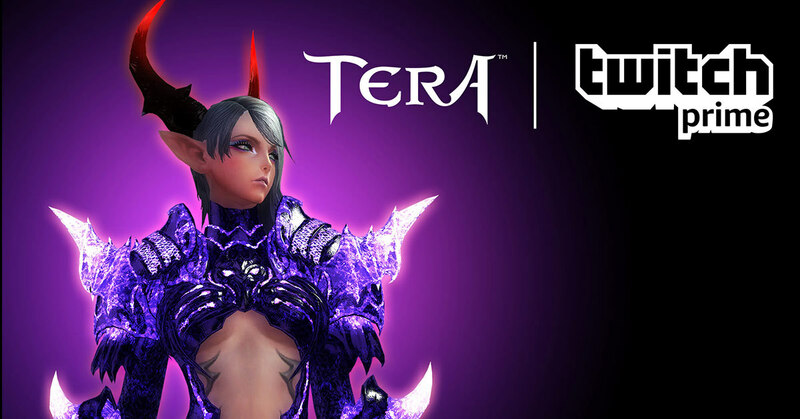 Today, we launched the PlayStation 4 version of TERA in Japan! Woohoo! In the interest of full transparency and to head-off any speculation or conjecture, we wanted to let you know that in the Japanese version of the game, the in-game store details the probabilities of winning certain items from loot boxes. 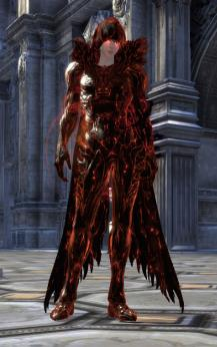 While many products in the Japanese in-game store may resemble products sold in the NA/EU console versions (and even the PC version is some cases), these products were created uniquely for the Japanese market and the probabilities published therein may not necessarily reflect the probabilities in other versions of TERA published by En Masse. We created this leveling event to celebrate the release of elin brawlers! So our rewards focus on elin brawlers, buuuuut it's also open to all brawlers! You'll receive some elin-only 7-day costumes. They're bankable and you can dress any other elins up in it on your account! Not sure if you saw, but there's this update with Fiery Featherweights (aka v76) - look in the Patch Notes if you want to see how to get to that option. "Added ability to hide visual effects created by other players." Could you all send me pictures of what they are meant to look like vs what they look like now please? @tisnotme I've replied to your question in the other forum post, but for completions sake, I'll add it here too! One (1) free character slot per server (Kaiator and Velika) will be delivered via Parcel Post when you log in between Tuesday, November 13 and Tuesday, November 20." I'd like to see all of the premium skin boxes receive updates to include all in-game character classes, similar to how Brawler was added to the Rogue's Gallery skins in both rare/Shadowlaced and standard trim. This was actually something we've been asking for, and it's been a bit slow, but some progress was made. Those changes have yet to come over to Console, but Bluehole has started to go back through older Weapon Skin sets and made versions available for Classes beyond the original eight. We attempted to include one of those changes during the release of Ninja on Console, specifically the Bloodshadow Weapon Skins, but there was a miscommunication that had occurred, and we later found out the intended skins wouldn't be available until a future game build version on Console.